We are delighted to announce in this issue of the Occasional Newsletter the receipt of a major financial contribution from Abu Dhabi-based Dolphin Energy Limited, DEL, towards ADIAS-backed archaeological investigations in the Emirate of Fujairah. 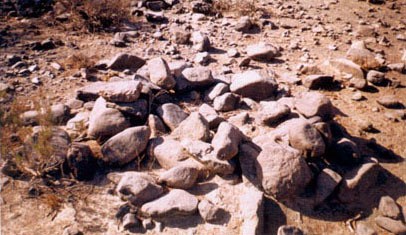 The work in Fujairah involves study of a large group of pre-Islamic burial cairns in Wadi Saqamqam, just north of Fujairah. The project has been designed with the advice and support of Fujairah Ruler and Supreme Council member His Highness Sheikh Hamad bin Mohammed Al Sharqi. Announcing the agreement, Dolphin CEO Ahmed Al Sayegh noted that the project fitted perfectly with Dolphin's own objectives of both conserving the environment and cultural heritage of the United Arab Emirates and supporting the training and development of UAE nationals in a variety of disciplines. "The archaeological sites in the Wadi Saqamqam lie very close to the Dolphin gas pipeline currently being built from Al Ain to the power and desalination plant on the Fujairah coastline at Qidfa," he said. "Dolphin is committed to protect the environment and cultural heritage of the Emirates, and we are delighted to be involved in the detailed study of these sites." The presence of previously unrecorded archaeological sites in the Wadi Saqamqam, just north of the city of Fujairah, was first recognised during a survey carried out by ADIAS in November and December 2001 for the Union Water and Electricity Company, UWEC, who are building the power and desalination plant at Qidfa and a water pipeline to Al Ain. The Dolphin gas pipeline will provide the fuel for the Qidfa plant. During further survey work undertaken by ADIAS for Dolphin in December 2002, the presence of more sites close to the gas and water pipeline routes was noted. The fieldwork in the Wadi Saqamqam has been directed by ADIAS associate Dr. Michele Ziolkowski, of the University of Sydney, and now a Fujairah resident, who has now recorded a remarkable total of 126 tombs in the wadi. All are believed to be pre-Islamic in date, perhaps from the Late Bronze Age or the Iron Age, although test excavations of three of the tombs failed to find any artefacts that would permit secure dating. Extensive evidence of occupation during the Late Islamic period has also been recorded, with pottery suggesting occupation during the 17th-18th Centuries. Logistics and other support was provided by the Fujairah Department of Antiquities, on the instructions of Fujairah Ruler and Supreme Council member His Highness Sheikh Hamad bin Mohammed Al Sharqi. ADIAS has expressed its thanks to HH Sheikh Hamad for his personal interest in and support for the project. A detailed report of Dr. Ziolkowski's survey and excavations is published in the Spring/Summer 2003 issue of the journal Tribulus (Vol. 13.1). Copies are available from the ADIAS Office. Read also about the Dolphin sponsorship of archaeology in their newsletter (pdf file). The area covered by the expanses of the deserts of Abu Dhabi is so large that ADIAS can never expect to carry out formal, detailed surveys on every square metre - or even every square kilometre. Recording of Abu Dhabi's archaeological heritage can only be achieved if interested individuals not only keep their eyes open while they are in the desert, but report their finds as well. 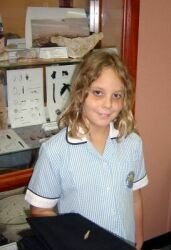 ADIAS was delighted, therefore, to receive an e-mail in late April from 9-year old Rachael Stamper, attaching an image of a piece of shaped flint that she had picked up in the desert while camping with her parents in the Arjan area, near the road to Hameem, one weekend. Was it, Rachael asked, an arrowhead? Yes, indeed - and a very nice one too. Rachael and her parents carefully recorded the GPS location of the site, which has now been entered on to our site database, along with a picture of the item, and, of course, proper credit for Rachael as the finder of the item. It's not necessary to be a professional archaeologist to contribute to the recording of the UAE's archaeology - many of the country's most important sites have been identified by amateurs. And it's not necessary to be an adult, either, as Rachael has shown. Following the completion of the ADIAS lecture series at the Abu Dhabi campus of Zayed University, ADIAS staff met with the University's Vice Chancellor, Dr. Hanif al-Qasimi, in mid-June to discuss plans for a further series for the next academic year. The lecture series for 2003-2003 included five separate talks, by Peter Hellyer, Dr. Mark Beech and Dr. Heiko Kallweit, on aspects of UAE archaeology, with a focus, naturally, on ADIAS activities, and a fieldtrip for several ZU students to our site at Abu Dhabi International Airport. As a result of the lectures, a ZU student is now working on the preparation of some leaflets, in Arabic, suitable for schools, as part of a University project. For next year, we now plan to repeat the series, bringing in other lecturers and topics, as appropriate, and also hope to organise at least one other field trip. Dr. Hanif has also welcomed the idea of trying to broaden the scope of the lectures to involve more of the University's students, perhaps some of those in the Foundation year. "The first part of my research will explore the evidence for maritime trade in pottery. One key aim is to identify the agencies behind the distribution of Mesopotamian Ubaid pottery in the Gulf. To this end, the meaning and role of Ubaid pottery in Arabian Neolithic society will be examined. Fieldwork conducted by ADIAS will be particularly useful in this respect, especially the excavations at Dalma. Another aim is to explore the practicalities of seafaring at this time. Excavations by the British Archaeological Expedition in Kuwait have provided evidence for the use of sailing boats made of bitumen-coated reed bundles. The importance of changing sea-levels, shorelines and winds will also be addressed. The second part of the study will examine the phenomenon from the Mesopotamian viewpoint. Issues include evidence for increasing social and administrative complexity during the Ubaid period, and the potential role of long-distance trade in precious goods (e.g. pearls) in effecting such developments. The Northern Ubaid will be examined, and this expansion of Ubaid material culture, styles and praxis will be compared to the relationship between Mesopotamia and Neolithic Arabia. Finally, the extent to which the Ubaid expansion prefigures the Uruk expansion will be assessed. Theoretical models recently used to structure our understanding of the Uruk will be tested against the Ubaid period, and the Arabia-Mesopotamia relationship will be set within a new theoretical framework." Four papers related to recent work undertaken by ADIAS will be presented at the Annual Seminar for Arabian Studies, being held in London from 17th-19th July. Vincent Charpentier will present a paper on Neolithic trihedral arrowheads and the Arabian Bifacial Tradition, which will be based to a large extent on his study of the flint arrowheads from Site MR1 on the island of Marawah. This will be followed by two papers related to our investigation last winter of the Late Stone Age and early Bronze Age site at Abu Dhabi International Airport. Dr. Mark Beech and Peter Hellyer will provide an overview of the work at the site, followed by Dr. Heiko Kallweit, who was our Site Director for the dig, who will report on the flint finds from the Airport and on a study of a collection of other flint tools from the deserts near Al Ain, made by Zayed University teacher Peter Rothfels. The ADIAS collection of flint tools is among the most extensive in south-eastern Arabia, and these three papers will introduce the finds, and their significance, to the broader academic community of archaeologists specialising in the region. Another paper is being given by our pottery expert, Dr. Robert Carter, who will talk on archaeological evidence for pearling in the Arabian Gulf. Part of the data for his paper derives from our ADIAS work on the Neolithic (Late Stone Age) settlement on Dalma, as well as from studies of pearl-oyster middens on many of Abu Dhabi's islands, including Abu al-Abyadh, Futaisi and Balghelam. The papers will probably be published later in the annual Proceedings of the Seminar. A major new book on the archaeology of the UAE has just been published by the Zayed Centre for Heritage and History, part of the Emirates Heritage Club, in association with Trident Press. 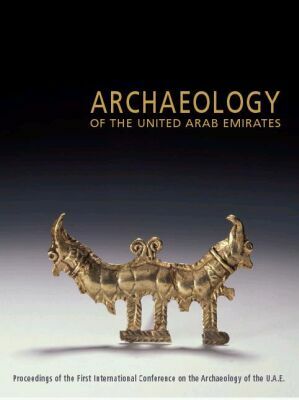 Entitled simply Archaeology of the United Arab Emirates, the book contains the collected papers of the 1st International Conference on UAE Archaeology, held in Abu Dhabi in April 2001 under the patronage of Deputy Prime Minister HH Sheikh Sultan bin Zayed Al Nahyan. The book, edited by Professor Dan Potts (University of Sydney), Peter Hellyer and Dr. Hassan Naboodah, Director of the Zayed Centre for History and Heritage, contains eight papers by ADIAS personnel, all of which refer, to some extent at least, to work undertaken by ADIAS over the years. Contributors include Beatrice de Cardi (on the evolution of archaeology in the UAE and its future), Elizabeth Shepherd-Popescu (on Dalma and Marawah), Vincent Charpentier (on aspects of flint technology), Dr. Robert Carter (on maritime trade patterns in the Bronze Age, including possible way stations on islands like Ghagha, Sir Bani Yas, Marawah and Balghelam, Dr. Joe Elders, (on the pre-islamic Christian monastery on Sir Bani Yas), Dr. Geoffrey King and Peter Hellyer (on sites in the Abu Dhabi desert) and Dr. Mark Beech (on the development of fishing, using data from Dalma, Marawah, Balghelam and other island sites). One of the current objectives of ADIAS is to bring the results of its work to the publication stage, so that the information collected during our surveys and excavations can be disseminated to a wide international audience, and the publication of this book will go a long way towards achieving that objective. Copies of the book will be available in due course from the Zayed Centre for Heritage and History. Since the launch of the ADIAS website on the 13 May 2001 there have been 215,711 accesses on the site (as of 28 June 2003). Visitors have downloaded more than 4 billion bytes of information! 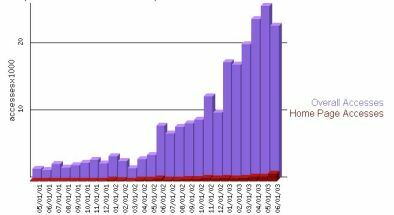 June 2003 has seen a record number of visitors to the website, with more than 20,000 hits representing at least 6266 unique visitors. The daily average number of accesses to the site during June was 743, representing at least 232 unique visitors coming to the site each day. The highest number of daily visitors recorded to the ADIAS website was noted on several occasions during the past few months: On the 8-9 January 2003 there were respectively 1074 accesses (279 unique visitors) and 1084 accesses (231 unique visitors). This surge in the number of visitors to the website was following the press releases and media coverage concerning the discovery by ADIAS of the 6-8 million year old Late Miocene elephant tusk belonging to the species, Stegotetrabelodon syrticus. Other recent peaks in visitor numbers were the 10th February (1162 accesses, 367 unique visitors), 22nd April (1003 accesses, 459 unique visitors), 8th May (1686 accesses, 373 unique visitors), and the 20th June (1,493 accesses, 341 unique visitors). The recent increase in visitors to the ADIAS website has been spurred on by the addition of many new features to the site including details of our current projects, newsletters and publications which are all freely available for download. ADIAS is able to carry out all of its expanding programme of work only with the support provided by a number of commercial and other organisations. We are delighted to acknowledge the receipt of a donation in late March from the National Bank of Abu Dhabi, which has been used to help support our databasing programme. With this ADIAS financial year coming to a close at the end of June, we, gently, remind our commercial sponsors that support for our 2003-2004 season of work will always be welcomed!